You just need to design a cue-routine-reward loop and work through it until a craving is created that drives the loop. It may take some tinkering and experimentation, but with enough patience and diligence, you’ll strike on something that works. Kind of creepy, you're basically addicting yourself to good behaviors. I don't know whether to say "addiction, but good behaviors!" or "good behaviors, but addiction!" One does not like to think of oneself enthralled, except that I do like to be enthralled. Hello, flow. That speck of the myth of control is just a little fly in the ointment, let me get that ::flick:: you're so much more than just your conscious mind, share the loooad. I actually am happy when I wake up. I love being in bed, I love being with the sweetie man. Getting out of bed under those conditions is the challenging part, so obviously what has to happen is that he has to get out of bed. Ahahaha I know, I am spoiled. After he gets out of bed, I prop myself up on all the pillows and wait for my tea like a princess. Then I drink my tea and publish the day's blog post (and depending, read my reader and feed my feed, er), and then I get up. Anyway I can see how this little ritual could lose a little of its efficacy and charm if you have to make your own tea, or maybe you are not a princess and feel perfectly empowered to make your own tea. Or if green tea and lemon is too fiddly, maybe just green tea, or just water with lemon, or just water. But basically every habit is formed of an intention ("I am going to start every day with green tea and lemon" or whatever) and then instructions for how you're going to do that, including a list of what you need to make this happen. In my case it was 1) willing boyfriend. I mean, I know some of the things he uses. He has a stock of black, green, mint, and ginger teas on a little shelf insert that he built on a pantry shelf. He keeps the lemon in a tiny mason jar that I got a sample of pumpkin cauliflower puree from Mimi in. Then try it out and tweak what doesn't work like juggling a cup of hot tea and a laptop in bed. That's why I have to do the pillows, so I can put the laptop on my lap and the tea can be put on the stand. Let me just say in my defense that I could too make my own tea. You know, I used to be able to go out to the living room and drink my tea and write my morning pages on the couch when I used to have the apartment to myself. I could make my own Japanese tea room with tatami mats and incense in the room that I used to use for a closet that now is being used, even in this actually radically feminist household, in the grand tradition of the man having a room of his own. I get the bedroom after he gets out of bed, and that room comes with tea service damn straight. Did you know that you always wake up a little dehydrated? Because you exhale a little bit of moisture with each breath, and presumably you've been breathing all night. So it's not a bad thing to rehydrate a little bit for all the reasons that it's good to hydrate, it wakes up your system, just generally, and specifically your digestive system that you want to be, you know, regular. You get that, right? That waste is what your body doesn't need and wants to get rid of? Just saying, regularity isn't an abstract virtue. But anyway that's why water, and antioxidants is why green tea and also why lemon. And then mentally or possibly even spiritually, it's this nice pause. Stephen Covey talks about the gap between stimulus and response, and that's where the self is. This green tea moment is like starting the day in that gap where the self is, between when you're asleep and when you're up and going. ETA 1/17/13: I'm super sensitive to unwittingly setting unrealistic expectations, kind of related to what the lady says in this post from You Look Fab, which is probably my favorite fashion blog, even though I think she would be aghast if she saw how I dressed; but I do think we think the same, just about different things. Anyway, clearly, the fashion part of this blog is not driven by needing to show you a new outfit every, er, ever, but by actually actively wanting to show me wearing the same damn clothes year after year. REAL TALK. So I didn't want to leave you with the impression that I start every morning like a perfect Zen princess. 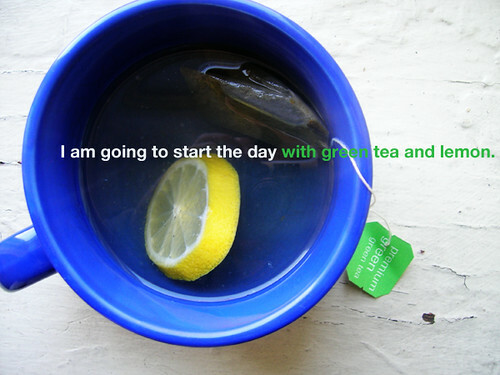 "Start the day with green tea and lemon" is the idea, but then I don't try to beat reality into the perfect shape of the idea. Reality takes its own shape, though still connected to the idea. And the nature of an idea is not to take a beating, as Lillian Gish says in The Night of the Hunter, they abide and endure. So ideas tend to be more visible, I would like reality too and its connection to the ideal to be seen. Reality is that I get to be a Zen princess on Monday and Wednesday, but on Tuesday and Thursday squeezing green tea and lemon in the minute between when I wake up and when I have to get in the shower doesn't do it for me, so I just have a swallow of water and hop into the shower, and on Friday and Saturday I'm frazzled and get coffee with milk, and on Sunday we get right up and go to breakfast at Hollywood Grill. ETA 3/16/13: Replaced this with Start the day with lemon water.